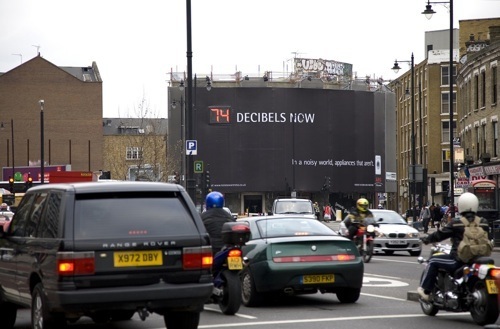 Image: Street advert in Hoxton, London, displaying real-time decibel level. March 2008. Russolo’s eulogy to the sonic city was inspired by the urban clamour of turn of the century Milan. “L’arte dei Rumori” betrays a fascination with novelty of noise, the signature of modernity and the promise of the future in the form of the industrial city. Russolo argued that music has reached a point where it can longer excite when pitted against the real world sonic complexity of new metropolis. In turn, this statement led to the formation of a new type of music based on machine inspired atonality and stochastic composition. 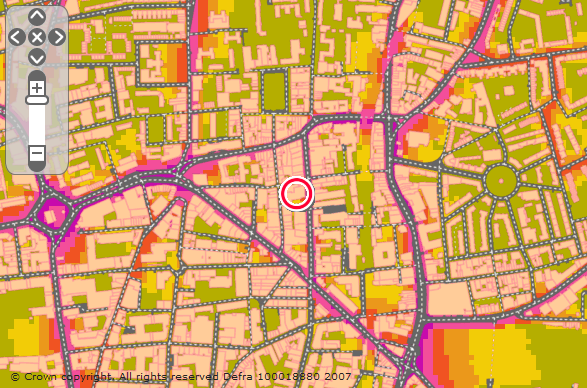 The much anticipated Noise Maps version 2 was released by our favorite government agency, DEFRA, last week. This version includes a noise source filter (road, rail, industry and air) – which ‘kind of’ works – and day and night switch. The maps spread beyond London to ‘agglomerations’ of over 250,000 people…everyone else will have to wait until 2012 for round two – or make do with pdf of ‘major roads’ and airports. Ubuntu is the Linux distro ‘for human beings’. This means it’s easy to install, maintain and use by ‘real people’ for everyday tasks. It’s available free and supported on an open source license by a global community of developers (and commercially supported by Canonical Ubuntu’s founders). In practice it’s a joy to use – lightweight, responsive with an uncluttered GUI, it genuinely works ‘out of the box’ on even the most obscure hardware (almost), and, importantly, doesn’t further line the pockets of Bill Gates or Steve Jobs. I’ve been using Ubuntu for about a year with the aim of eventually liberating myself from the tyranny of Windows and OSX – yet however good the OS is, it’s only as useful as the software that runs on it. I would like to see a free, open-source professional set of music tools running on a freeopen-source professional platform; The latest version of Ubuntu (8.04 Long Term Support) has just been released so it’s a good time to review the feasibility of music making with open source only software. Most of the applications detailed here are bundled with Ubuntu Studio a ‘multimedia’ dreivative of Ubuntu – or can be installed separately via Synaptic Package Manager. Onomatopoeia is a word that imitates the sound it describes e.g. ‘Crash’ , ‘Miaow’ etc. and as such are possibly the origins of spoken languages being the simplest form of communication – imitating an object to communicate meaning ( for instance in Chinese ‘Mao’ 猫 has become the word for a cat, based originally on it’s sound). Onomatopoeic words are some of the most recent additions to languages, incorporating direct imitations of the post industrial world, ‘Beep’, ‘Zap’, ‘squeak’…occasionally becoming nouns; ‘ratchet’, ‘Crank’ etc. Curiously onomatopoeic words vary considerably across the globe; different cultures seem to hear differently. 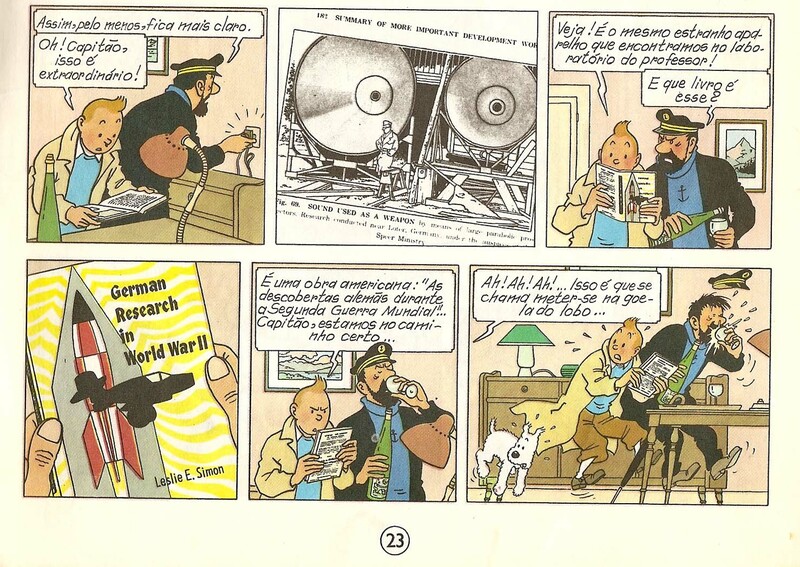 Languages themselves once established obviously restrict and distort the ability to form ‘pure’ onomatopoeic words but cultural variations also play a part – in the same way that the perception of musical tone and harmony vary across cultures. As an experiment i propose a WIKI Onomatopoeia library which would allow anyone to describe their literal interpretation of sound – not the accepted cultural/linguistic form (e.g. ‘woof’ for a dog) but what the individual hears. This would form a living recording of audio interpretation and the cultural variations and distortions that occur in different regions. Infrasound is low frequency audio beneath the human range of hearing. Infrasound constantly surrounds us, generated naturally; wind, waves, earthquakes and by man; building activity, traffic, air conditioners and so-on. Low frequency sound is used by marine mammals to communicate over vast distances and by birds to determine migration patterns. 7 Hz: Supposedly the most dangerous frequency corresponding with the median alpha-rhythm frequencies of the brain. It has also been alleged that this is the resonant frequency of the body’s organs therefore organ rupture and even death can occur at prolonged exposure. Scattered around the South East coast of England are these concrete objects. They are Acoustic Mirrors, built from 1916 to the mid 1930’s as an acoustic early warning system . The mirrors were simply large ‘acoustic ears’ used to locate approaching enemy aeroplanes and Zeppelins by amplifying and pinpointing engine sound – they had a range of around fifteen miles which gave a few minutes extra warning over visual location . The parabolic mirrors reflected and focussed the sound into one spot which was picked up by the listener through a rubber tube attached to the ears – a great example of the practical application of British exentricity. The mirrors eventually became obsolete with the development of faster aircraft and killed off entirely with the invention of Radar. Acoustic Location and Sound Mirrors. Sounds From Memory #3: Riot. The intention of these series of posts is to document sounds that have remained in memory. Not sounds that are particularly pleasant or trigger ‘Proustian Resonance’ but unique sounds that once heard are never forgotten (therefore impossible to reproduce or record). If i get enough – and please add your own – i’ll organise them into a top ten ‘mnemaudio’ chart. Miles was the first casualty, and, I always maintain, the inspiration for the violence that took place at the Trafalgar Square Anti-Poll Tax protest in 1989. During what was an admittedly tense but peaceful sit down protest in front of Downing Street, Miles charged at the Police brandishing a metal pole. He was immediately floored, struck on the head by a brick thrown from the police lines*. Seconds later the police panicked and sent mounted riot squads charging into the unarmed protesters, this event ignited a day of fierce fighting in the centre of London. For six hours the police held protesters in the square: The sound that fixed in my memory is the combined roar of bottles and bricks being thrown, burning buildings, screams, police sirens, helicopters, horses, whistles and ambulances which, after six hours, merged into one high pitched continuous distorted scream. This noise stayed with me for weeks, day and night -a kind of hysterical tinnitus. *I dragged miles to an ambulance which took him to hospital. A few hours later he discharged himself, concussed, dripping blood from a head wound he returned to the battle pressing home his assault on the forces of ‘law and order’. Designed and built by the American technology Corporation in 2005 and originally designed as a ship to ship hailing device to protect US naval shipping, LRAD is now used by the Illegal American occupation forces in Iraq as an assault weapon, by the US government on their own people as part of their ‘non lethal’ arsenal for crowd control and more recently by the (US sponsored) Georgian state to repress internal dissent. The LRAD is basically a series of in-phase speakers (not a infra-sound generator as commonly supposed). The phasing of the sound (combined amplitude giving louder sound) gives the device the ability to project high frequency sounds over a long distance at high volume.To focus the sound the LRAD uses a set of out of phase speakers around the perimeter of the device to phase-cancel the sound giving a directional arc of 30 degrees. Fifteen degrees outside the beam, the volume drops about 20 dB which although still loud means that the operator can focus the LRAD to a specific target without being themselves affected. Range: 300 meters over land or 500 meters (1640 feet) over water. Location: Outside the Odeon Cinema, Oxford UK. Walking out of a cinema in that familiar post film haze, the man next to me stepped out into the street and was hit by a taxi. The sound was a short but very loud bang followed by the smashing of glass (was he carrying bottles or was it the car headlights shattering on impact?). I was surprised by the solidity of the bang considering the softness of a human body against a metal surface and confused, the man had disappeared right in front of me. Where had he gone? was he under the car or had he bounced off the vehicle bonnet into the street? The taxi had come to an immediate halt some distance away (film sound effect of screaming tires) the driver gripping the wheel with both hands, staring straight ahead. Andy (Wilson) and I regularly cite the MRI scanning machine as a prime influence on sunseastar’s music having both been fortunate enough to witness the machines unique timbre up close (…are sunseastar the only group where all members have had brain scan?). The Magnetic Resonance Image Scanner is a medical device used to generate images of the soft tissues of the brain for the diagnosis of illnesses. The unfortunate patient is strapped to a horizontal bed which is introduced slowly into the small cavity of a large metal wheel – a very claustrophobic and alarming experience – you are allowed a view of your feet via a mirror near your head but apart from that you can see nothing. The staff switch the machine on and leave the room with unsettling haste.